These Adorable Handprint Crafts for Mother’s Day are perfect for any Mom who loves gifts made by her little one’s handprints – after all, they grow so fast! Did you know that one quarter of all flowers bought during the entire year is spent on Mother’s Day alone? Yes, that’s how much the world wants to celebrate it’s mothers and give them gifts! Well, flowers are always a favorite, but for a mother, nothing can beat a handmade gift put together by her own kids – age no bar! And of all the things to make for Mother’s Day, gifts personalized with kids’ photos or handprints are the most endearing – especially since we know that those little hands won’t be the same size next year! 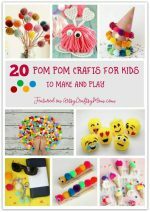 So here are 20 absolutely adorable handprint crafts for Mother’s Day, that kids of all ages can try. So what are you waiting for? Let’s get to the list right away! Encourage gardening with flower pots decorated with adorable thumbprints, as shown in Mom Always Finds Out. 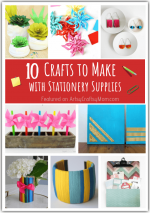 Get out the paints and make butterflies, bees, flowers or anything that catches your fancy. 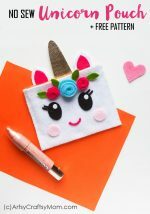 The Best Ideas for Kids have a fingerprint craft that can give any store bought mug a run for it’s money!! With finger prints in pastel colored paints, you can get some very pretty butterfly mugs for Mom. Every Mom carries her kids in her heart, and now she can carry their thumbprints close to it! 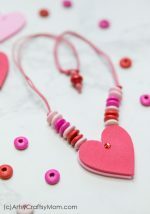 Check out this salt dough necklace project at That’s What Che Said to know how exactly you can make these gorgeous pieces. Moms are so busy putting others’ stuff away that they forget that they need a place for their own things! Solve this problem with a cute salt dough jewelry dish from Messy Little Monster. Make it more personal by using Mom’s favorite colors! This Mother’s Day, give Mom some time off to read her old favorites – and give her a pretty bookmark to mark her place! Live Craft Love has an easy but sturdy project to make handprint bookmarks that’ll encourage Mom to read more! Here’s a craft that uses not just handprints – but footprints as well! Let siblings get together to create vases made of footprints and flowers made of handprints. With lots of paint and some straws, you’ll end up with a beautiful flower vase! Details at A Little Pinch of Perfect. This project from Grey House Harbour requires a bit of work but is so very cute!! Especially if one of your kids is a baby, those tiny handprints will melt your heart! Use good quality supplies to make the key chain more durable. Let Mom know how much her little troll loves her with this adorable handprint craft from The Best Ideas for Kids! With both boy and girl versions, this craft works for everyone, and you can customize the text inside according to the child’s age. Channel your inner Frida Kahlo with these pretty handprint cards from Non Toy Gifts! Once you have the basic white paper handprints in place, you can go about decorating them any way you like. Add googly eyes, flowers or anything that you like! What could be cuter than seeing your little one’s handprints on your desk? A smiley little photo, of course! But it’s Mother’s Day, so you can have both – in a cute little picture frame craft from Mommy’s Bundle! Planning to get Mom some fresh flowers for Mother’s Day? Then don’t make her hunt around the house for a vase to put them in – make her one! Christinas Adventures show us how to turn a plain mason jar into a simple vase personalized with a little handprint. We’ve all heard stories of how Mama Bird takes care of her little birdies. Bring this cute tale to life in our fingerprint bird card! Let Mamma do the big bird and kiddo do the little chick for some originality – add in some real twigs too! It’s not enough to preach about going green, it needs to be practiced as well! Nifty Mom turns Mother’s Day eco friendly with these hand-printed canvas tote bags. There are so many designs to choose from, but my favorite is the sunshine one! Your child is the precious flower of your garden, which is why this handprint flowering tree makes perfect sense for Mother’s Day! Krokotak helps us create this awesome tree with colored craft paper – it’s easier than it looks! What is anyone’s favorite thing? A hug from Mom, of course!! Let Mom know this fact with a huggy Mother’s Day card from Moms and Crafters. The googly eyes, ribbon arms and handprint hands make this hug look very real! Moms and kids light up each others’ lives, and this easy craft from Crafty Morning represents this beautifully! Gather little fingerprint fireflies in a craft paper mason jar and add a cute note. Use yellow glitter paint for more ‘fire’ in the flies! You won’t believe that these gorgeous spring lilies are made with handprints on paper! One Little Project has detailed instructions on making this possible, and the result is impressive indeed! 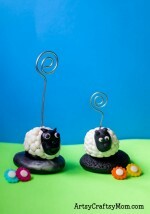 This is such an adorable gift that any Mom will treasure all her life! This keepsake craft from Teach Me Mommy is a good collaborative project for siblings. Never mind if the hands of different sizes and the frame is a little lopsided – it’s the imperfections that make it perfect! Show Mom how much you love her (and her cookies) by gifting her this oven mitt, handprinted with your love! The Idea Room also provides a printable gift tag that adds a lot to this simple little gift! It’s a rare occasion for a Mom to have her tea or coffee while still hot, but this craft from Better Homes and Gardens will ensure it is at least heart-warming! Get the kids to get their handprints on a plain ceramic mug so Mom can smile every time she has her cuppa! 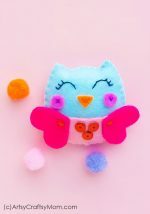 You’re sure to find a craft suitable for kids of any age, whether it’s a simple handprint on an oven mitt for a toddler, or a more sophisticated charm necklace for a pre-teen. Whatever you choose from these handprint crafts for Mother’s Day, you can be sure that Mom is going to love it with all her heart!